The following is a recipe I tried out from here. With the Thai Vegan event happening, I was on the lookout for some easy recipes, as although loving thai food, I had never before tried it at home. I try to keep away from peanuts in cooking, plus didn't want to go through the entire process of making the sauces and everything. Anyways, after narrowing down on a curry (rite, we love curries), this is what I have. I have used the store-bought readymade green curry paste, and I must stress here, that although my picture indicates a bland curry here, its deceiving. That paste was just overly spicy and so the curry went a long way in the spice level even without the spice color. All in all, we were extremely pleased with this flavorful, spicy, coconuty, vegetable curry and with the ready paste, it worked to be really really easy. I have adapted the recipe to suit us. You can see the original recipe here. Straw mushrooms, drained - 1 can. I did not use this time, but definitely would recommend. Thai kitchen green curry - 1 1/2 - 2 tbsps. Vegetable broth - 1/2 cup. - Put a large pot of water to boil. - Slice tofu into 1/2"x1" pieces and on a greased baking sheet, bake them in the oven at 275F for 30 minutes till lightly browned. - Clean any grit from the mushrooms if using. - Add the fresh veggies and the potatoes to the boiling water. Cook just until al dente. Strain and set veggies aside. - Carefully open the coconot milk can WITHOUT shaking or disturbing the can. Spoon out the white cream from the top while keeping the clear liquid at the bottom. You will find the clear liquid after spooning out more than half of the can. Keep them both separate. - In a large pot or deep frying pan, combine the clear coconut liquid and the vegetable broth. On medium heat, cook the veggies, tofu, bamboo shoots until cooked but not mushy. Add more broth to cover all the vegetables while cooking. Add the mushrooms and peas midway. - Slowly stir in the coconut milk for desired consistency. Add in the green curry paste and the salt and cook till raw smell goes away. - Serve hot with rice. - I used only 1/4 of the reserved cream of coconut. Used all of the clear liquid. The original recipe says that this method of separating the clear liquid and the cream is used to get rich curries. - You could use a mix of many or just a couple of vegetables in this dish. - This dish tastes better with time, like for the next meal. 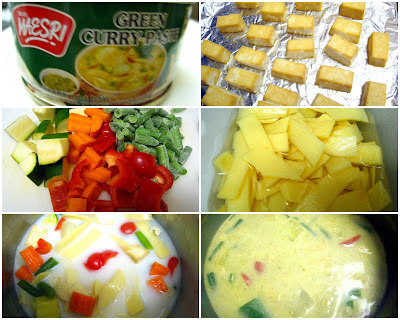 - I used the 'Maesri' brand of green curry paste. Its very spicy and fragrant. 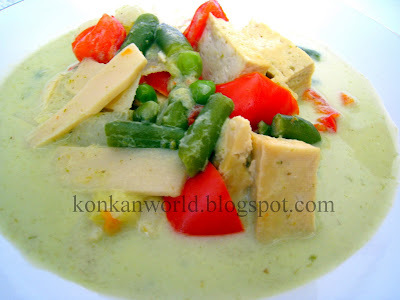 This post is off to ' Its a Vegan World - Thai ' , hosted by Priya of Akshaypatram. Its a Vegan World is the brainchild of Vaishali of EarthVegan. 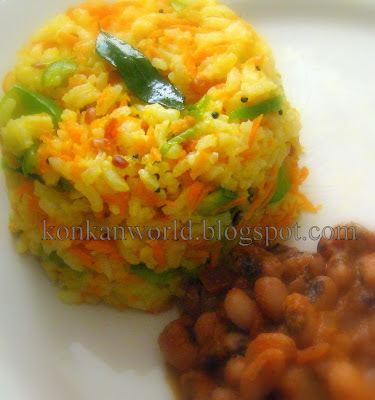 This post would also go to FIC - Red & Green, hosted by Neha of EasyNTasyRecipes. FIC is the brainchild of Sunshinemom of TongueTicklers. Come a little warmer weather and we are looking for coolers and thirst quenchers. Today I have a Mango-Raspberry Ice cream here. 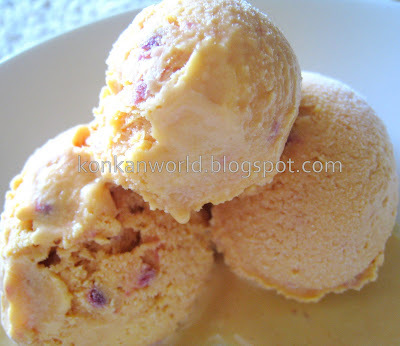 I followed the recipe from showmethecurry.com for this super easy and yummy ice-cream. The recipe was for Mango Ice-cream but I added raspberries also and it turned out very good. You can see the original recipe and the video here. - If using fresh raspberries, chop them into little pieces. If using frozen ones, just lightly crush them with the back of a spoon and they breakup easily. - In a big bowl pour in the mango pulp, whipped topping, condensed milk and the raspberries. - Fold them in very gently. Do NOT use an electric beater or whisk rigourously. - Pour into a dish with a tight fitting lid. - Cover and place in the freezer for 2 hours. - If using the cubed mango pieces, after a couple of hours, mix in the cubed Mango pieces and return dish to the freezer. If not also, remove from the freezer, mix once and return to freezer covered. - Allow it to freeze for another 3 hours or so. And then its done. - I have not used the cubed mango pieces. - You can use fresh mango pulp instead of canned one. - Add in any other kind of berries like strawberries, blackberries, etc., instead of raspberries. 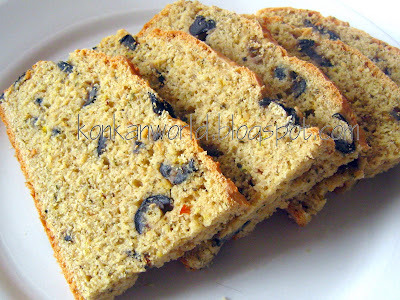 -You can add in Tutti-fruiti, nuts, saffron or cubes of cake for a variation. This post is my contribution to My Favourite Things - Frozen Desserts, hosted by Aquadaze of Served with Love. My Favourite things is the brainchild of Bindiya of InLoveWithFood. Also goes to Mithai Mela, hosted by Srivalli of Cooking 4 All Seasons. And also goes to Festive Food-Summer Treat, hosted by Priti of Indian Khana. Last but not the least, also goes to 15 Minute Cooking, hosted by Mahimaa of Indian Vegetarian Cooking. This rice comes to my rescue most times I'm out of ideas or am in no mood to cook anything elaborate and still don't feel guilty of not making the right food at home. An all in one, delicious and filling lemon rice with the addition of carrots and green-peppers to make it a good eat for kids and adults all the same. Being a one dish meal, and colorful too, its easy to get my kid to eat it. The carrots and capsicum still remain slightly crunchy as they are not fully cooked, and it tastes good. Green chillies, slit lengthwise - 3 nos. - Cook the rice and keep it aside to cool. - Heat oil in a pan, add the mustard seeds and once they crackle, add the udad dal, chana dal, green chillies, ginger and curry leaves. Once the dals are browned, add the turmeric powder and salt and switch off the flame. Add the carrots and capsicum and mix well and cover and keep for about 10 minutes. The heat from the pan is enough to soften the veggies. No need to cook them. - Then add the rice and the lemon juice to the pan and mix everything evenly with care to not break the rice. - Serve as it is or with a side of your choice. This goes to CFK - Rice event hosted by Trupti at RecipeCenter. Cooking for Kids event is a master mind of Sharmi of Neivedyam. This also goes to FIL - Carrot event, hosted by Sanghi of Sanghi's Tasty Bites. A delicious creamy dish made from Black-eyed peas/Alasande. All the spices, whole and ground, make this a fragrant and delicious side-dish for rotis or rice. I have adapted this recipe from the book, 'Indian Home Cooking'- by Suvir Saran & Stephanie Lyness. Black-eyed peas/Alasande - 1 cup, soaked in water overnight. Garlic cloves - 2 nos. minced with 1/8 tsp of the cumin seeds with mortar/pestle. - Pressure cook the peas with water just enough to cover the surface and cook for 1 whistle on medium high heat. The peas should be cooked but not mushy. - Heat abt a tbsp of oil in a pan, add all the whole spices, then add the onions and fry till browned. - Add the garlic, saute till lightly browned, then add the coriander & cumin powders, red chilli powder, saute a few seconds. - Add the tomato puree, fry well and simmer for about 5 minutes. - Separately, whisk the yogurt in a bowl, stir about 2 tbsps of the hot sauce into the yogurt to temper it. 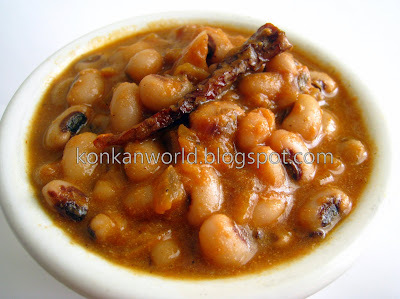 - Once the tomato is fully cooked, stir in the tempered yogurt, garam masala powder, cooked black-eyed peas and water. Turn the heat to medium and heat until it just bubbles. - Do not boil again after this, as the yogurt will curdle otherwise. - Serve hot with rotis or rice. This post goes to WYF-Side Dish, hosted by EC at Simple Indian Food. All I can say about this bread is that it is delicious as well as truly fragrant. Not too many calories as compared to other bread recipes, and works just fine for breakfast, lunch, dinner, or simply as a snack. It looked and tasted just great, but the only problem I felt was that it was a little delicate and gave way easily. Not sure if its the binding agent or anything else. I would like it to be more firm next time, so if you have any suggestions, please let me know. 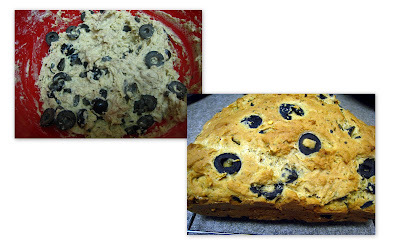 I have tweaked the original recipe to make it eggless and also added/subtracted a few ingredients to suit our taste. The original recipe is here. - Preheat oven to 350 deg F.
- Coat a 9x5 inch loaf pan or a square pan or baking sheet with oil or non-stick spray. - Combine the flour, baking powder, baking soda, dried herbs, whole cumin, ground cumin, red chilli flakes, in a medium sized mixing bowl. Stir with a fork to distribute. - Add the buttermilk, milk, and oil. Stir until moistened. Stir in the olives and nuts (if using). - Smooth the dough into prepared pan or if using baking sheet, form dough into a ball shape, place on pan and flatten into a round about 3 inches high. Brush a little olive oil on top if desired. - Bake about 40-45 minutes, or until brown and knife inserted into center comes out clean. - Reduce or omit the cumin seeds if you feel its too much, since there is ground cumin also. We love it, so I have added the whole ones too. - I have added the red chilli flakes for the extra zing. You may skip it. - I have used the store-bought cultured buttermilk. 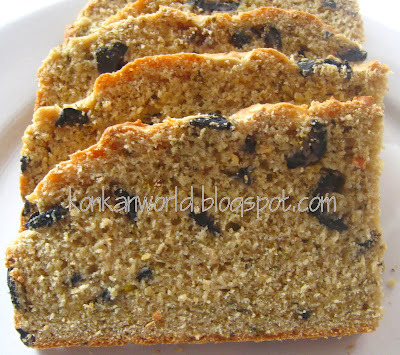 This makes its way to BBD#18- Quick Breads, hosted by Mansi of Fun & Food Blog. Thanx for hosting Mansi. This also goes to the Egg Substitute Event - Yogurt/Buttermilk, hosted by Madhuram of Eggless Cooking. Thanx to so many of you who mentioned here about this event, this now also goes to AFAM-Olives hosted by Priya of Priya's Easy N Tasty Recipes.